Typically, university press books restate the obvious and do so with so much excess verbiage that it’s not hard to understand why mainstream publishers, those with a profit motive, typically reject those books out of hand. Appletopia is a rare exception to that rule. The author, Brett T. Robinson, a Notre Dame marketing professor, has something brand new to say and makes his points about Jobs in a compelling, even irresistible manner. 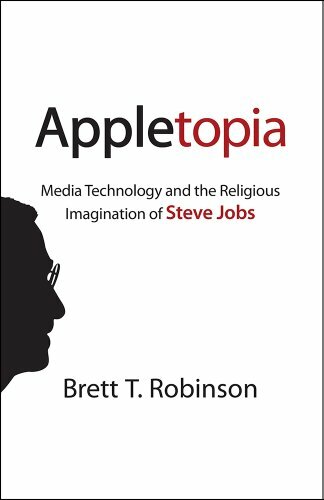 Robinson’s message: Those who consider Apple a cult are absolutely right; and Steve Jobs would have had it no other way. Everything about Apple, Robinson writes, from the logo to the advertising to the way the products are sold and bought, connotes a religious feeling. First, take the name of the company. Apple. The first fruit in the Bible. And then take a look at the design of the logo—a bite missing. If you can’t see the connection between the Garden of Eden, the tree of knowledge, and the latest iteration of the MacBook Air or the iPhone, Robinson suggests, you’re just not paying attention. Then take the iconic 1984 Apple ad—the young woman running through the Orwellian nightmare scene and smashing the screen. This, Robinson suggests, is Gnosticism, a means by which one transcends the standard belief system of the day and comes, in an instant, to know God. Remember the early iPod ads, where young people, silhouetted and anonymous, were shaking and grooving in a spirit of ecstasy to music on their new devices? Religious ecstasy, pure and simple, Robinson says. You aren’t just buying a music playing device. You’re buying a means by which to leave the physical world behind. Even the architecture of the Apple stores is a vital aspect of the cult, Robinson argues. It’s different from anything else out there in retail. People line up for days when new cult objects, be they iPhones or iPads, become available. Seriously, when was the last time that thousands of people around the world lined up for days in advance to buy anything? If Apple is a cult, Robinson suggests, then Apple stores are today’s cathedrals. By contrast, Apple would delay shipping a product until it was absolutely perfect. The company didn’t seem to care if it would make money in April or June—it knew that it would make buckets and scads of money whenever they released a new product or a new version of an old product. But while Jobs was in charge, nothing left Cupertino until it was bug-free and delightful beyond measure. There’s not a lot of perfection out there, and Apple certainly seemed to have cornered the market on it. So is Robinson right? Is Apple a cult? Is that how Jobs sought to build it? Or was he just trying to create truly marvelous devices, and enough people fell in love with those devices that the company developed a cult-like following? Jobs was certainly a spiritual seeker in his lifetime, having traveled to India and also having studied the Christian art and philosophy of William Blake. Nowhere is it written that Jobs intentionally established Apple as a spiritual entity, and yet there is something spiritual about pretty much everything that Apple brought to market. Robinson makes a strong case for the spiritual underpinnings of Jobs’s creation in a fascinating, hard-to-refute way. Centuries from now will people be venerating early iPhones and iPods and pausing to pray each day in the direction of Apple’s main campus at 1 Infinite Loop? The only one who might really know the answer to that question is Siri. And she isn’t saying.